I recently rented the Canon 5D Mark III for 10 days to take on a vacation and thought I’d share my experiences here. So many people have already reviewed the camera that I’m not going to put it through the same technical paces, so this review is generally regarding what I liked and didn’t like. I also provided the customizations of the camera that I made to it, in case anyone finds that useful. If you read nothing else beyond this sentence, this one word sums up the camera: remarkable. I’m comparing this to my current 7D to provide a frame of reference for those familiar with Canon’s current lineup (as of mid 2012). My only regret with my shooting is not having an ultra wide angle lens that works with the 5D III; the widest EF lens I had along was 24mm. 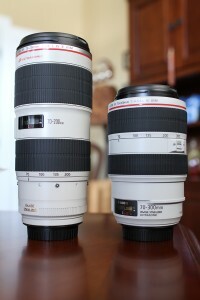 I would have liked to have the 16-35 f/2.8 II or the 14mm f/2.8L II. The ISO range of this camera (usable up to 12,800 with three more sort-of usable stops above that) opens up a world of possibilities. Shooting at f/16 and getting crystal clear photos in less than ideal light is easily possible. Or, shooting a sunset hand held at f/1.4, ISO 12,800 is possible while still getting very usable image quality; I actually did that, and you can see the result here. Generally, image quality is significantly better than the 7D once I get above ISO 400 or so. Even at ISO 100, there is an extra sense of sharpness and presence in photos taken with the 5D3 vs the 7D. 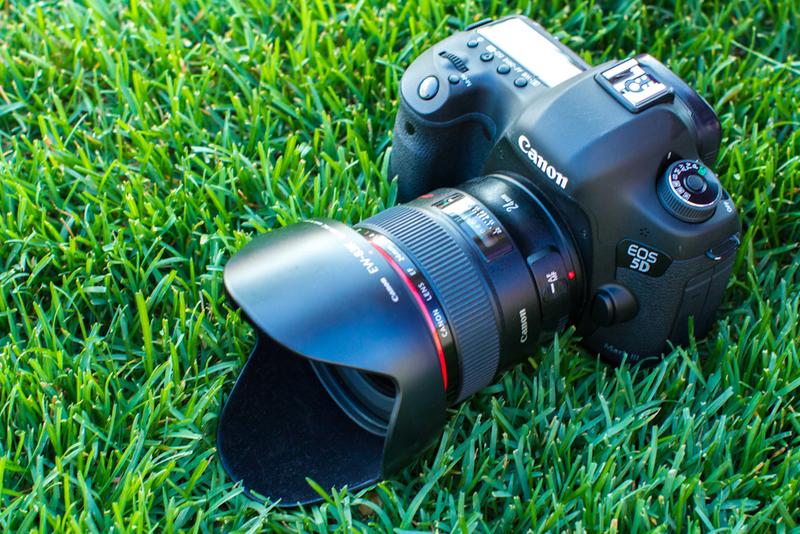 My primary complaint with the 7D is noise in the image; the 5D produces super smooth images at most ISOs. Adobe Lightroom goes a long way to fixing noise with the 7D’s images, but that only can be taken so far. One change that was made from the 7D that I’m not sure about is the position of the zoom button (the magnifying glass button right above the image playback button). While I like that it can be set to zoom to 100% on the focus point, its position takes some getting used to compared to the zoom button on the upper right side of the camera like the 7D. When I got the camera, the following are the settings I changed to customize the camera to how I use it. I set up My Menu to have the following items: ISO speed settings, Protect images, Erase images. The ISO speed settings allows for setting a minimum shutter speed when in Av or P mode, which is great when I’m using a wider lens like a 24mm and want to catch action with it without using M mode. This is an awesome feature, and I’m going to miss it on my 7D. My only complaint is that it maxes out at 1/250 sec. I wish it would go up to 1/1000 sec, but I understand that to be a feature they reserve for their 1D series. The sad part is it’s just a software setting, not a limitation of the camera, that Canon chooses to impose. Image quality: I set it to RAW+L. The RAW files are almost mandatory for post-processing. During my vacation, I took some high contrast sunrise and sunset photos and so RAW was very useful for putting finishing touches on the images. Beep: disable. I don’t like it when the camera beeps when it locks focus. Carrying a huge DSLR draws enough attention, let alone having it beep every time focus is locked. Shooting mode: silent continuous. Unless you need the higher 6fps or the minor reduction in shutter lag that the non-silent mode provides, the silent mode produces a shutter sound that’s very quiet (it’s not silent, despite the name that the marketing folks decided to put on the feature). Interestingly enough, silent mode seems to agitate animals at the zoo; perhaps it’s a higher pitch sound that people can’t hear. In any event, I love it and it makes shooting so much more discreet. Orientation linked AF point: select separate AF points. This allows me to set the focusing mode to three separate settings: horizontal, and two vertical modes. This makes it very convenient to switch between, say, a focus point in the lower right of the frame for a horizontal picture and a top slightly-left-of-center focus point for portrait shooting. VF grid display: enable.  I really have to concentrate to make sure my horizon lines are straight, and the gridlines help quite a bit with that. Custom controls. I set the DoF preview button to switch between One shot and AI Servo. The DoF preview button is on the right side of the camera and so I can hold it down with one hand to toggle between one shot and AI servo modes. The 7D that I own has this feature, but the DoF preview button is really tiny and is on the left side of the camera. 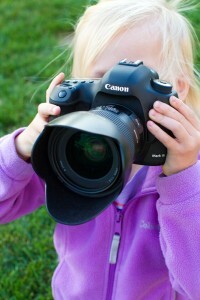 The 5d3’s position is far more usable in my opinion. Below is a noise comparison between the two cameras at ISO 100 for the 7D, ISO 125 for the 5D3. 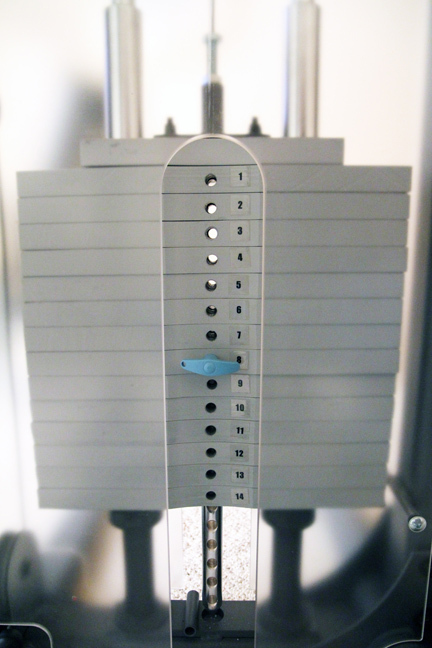 Click to enlarge the samples. These are 100% crops of the sky. 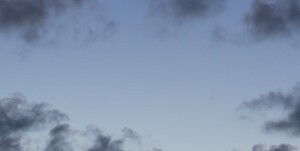 Unfortunately, the 5D3 picture has more clouds in it than the 7D did, but check out the smoothness of the 5D3’s sky compared to the 7D. These are both crops of the camera-generated JPGs and have not been processed in any way other than to crop them. There are two separate pictures followed by a single photo with the two images side by side in a single file. To wrap this up, I would like to get this camera as soon as possible, though I’m holding off because it sets off another tidal wave of lens purchasing for me: 85mm f/1.2L II, TS-E 17mm f/4 L, 8-15mm f/4 L USM Fisheye, 24-70 F/2.8L II USM, 24-105mm f/4 L IS USM, 14mm f/2.8L II, 16-35mm f/2.8L II. The main reasons I like the camera are: quiet shooting mode, full frame image quality, minimum shutter speed in Av mode, the remarkable 61-point autofocus system, the repositioned DoF preview button (which I reprogrammed to switch between one-shot and AI servo AF modes), dual memory card slots for instant backups, and the large, bright optical viewfinder. Compatibility with my 7D batteries is a nice plus, too. I posted a picture I took with the 5D and the 70-300mm f/4-5.6L lens and a 100% crop of that same picture as a comment on an earlier post of mine comparing the 70-200 f/2.8L II to the 70-300 f/4-5.6L lens. Any questions, please let me know, and I’ll try to answer them. This item is now sold! 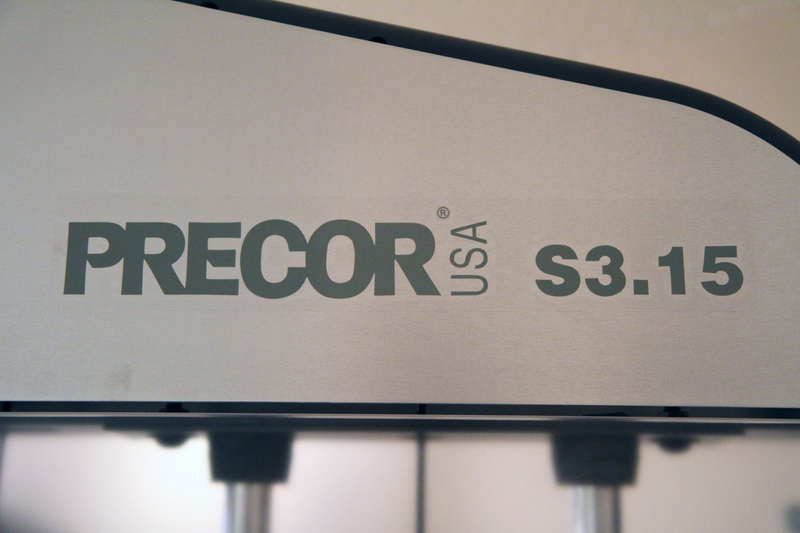 I’m selling my Precor S3.15 strength system for $850. My wife and I have had it for a few years, but we use it too infrequently to justify the amount of space it takes out of a main living area. I’m sad to part with it since it’s such a great unit, but with kids and limited space, it’s just time for it to go. It is barely used, and could pass for new. We’re also including a number of accessories. It had a 10 year warranty when we purchased it new, so it has a number of years remaining. Normally, I don’t like to try to sell items through my blog, so please bear with me. 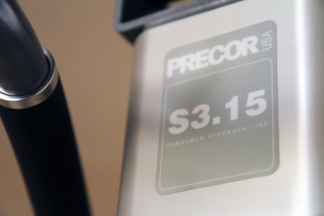 This is a Precor S3.15 weight station ($1299 retail, $1099 “street”), and we’re including some accessories purchased at Scheels. 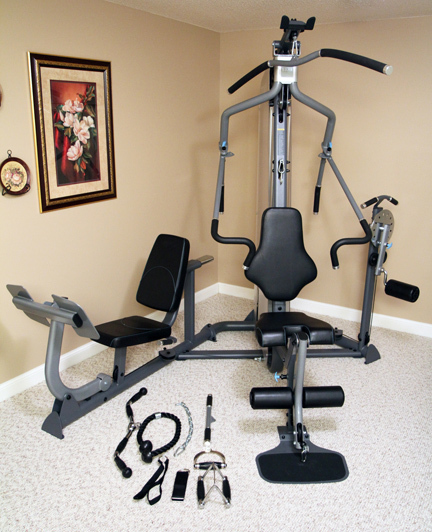 The equipment includes a 150 lb weight stack, weight shroud to keep little fingers out, a leg press attachment (about a $400 upgrade to the base machine), and multi-hip attachment (about a $200 upgrade). The accessories include a lat bar, straight bar, curl bar, rope, V-shape handle, single handle, and chain. We’re asking $850 (or feel free to make an offer) for all of the above — weight station, attachments, and accessories — which would cost about $1800 if purchased new ($1700 for the station and attachments, and $100 or so for the accessories). The S3.15 is a single weight stack gym with more than 25 exercises for full-body, strength building workouts. Below are some additional specifications. Cables – 1/8 inch military spec cables with nylon sheath. Tested to 2,000 lbs (909kg) tensile strength with Nylon/Fiberglass pulleys for added durability with swiveling cable ends. Leave a comment, send me a tweet, or talk to me in person if you’re interested. This would be a great way to kick off your new years resolution list if your list includes more fitness. Click each photo below to enlarge. I just had 3 1/2 weeks off work for the birth of my son. This is the longest vacation I’ve had since I was in grad school (back in the late 90’s), and I’ve found it to be good opportunity to engage in some introspective thinking. I’m deeply grateful to my employer and my team to allow me to take such an extended amount of time off during this important time in my family’s life. Below are a few things I’ve learned. Not that I didn’t know these already, but they certainly were re-emphasized. Facebook is a great tool, but it’s possible to be on it too much. At least with my network of friends, not that much happens such that it needs to be checked every few minutes. If I’m clicking refresh on the page, odds are I could be spending my time better elsewhere. Work goes on without me. I check my e-mail occasionally, and my team continues to get work done. Life goes on without me. That’s good; it means the team is built to a point where it can run for extended periods of time. It’s also a bit scary in that it can run without me. Routines take a long time to create. After more than 3 weeks off, I’m just starting to get into a routine with my day with my family. It’s going to be another period of time to get into a routine once I’m back at the office. There’s far less free time at home than I expected. With a toddler and a newborn, free time is scarce, and when it does happen, all I want to do is nothing. My ambitious list of career-oriented items to do during my time off barely was touched, though I did make some progress. I also spent far less time with my camera than I expected, given that I have a newborn in the house. On the other hand, he doesn’t do much yet, so there aren’t a lot of expressions to capture. Time off provides perspective. Without the daily grind, I was able to disengage from the wheel-spinning activities of life and concentrate on the bigger picture in life and work (in between toddler-created messes and diaper changes, of course). 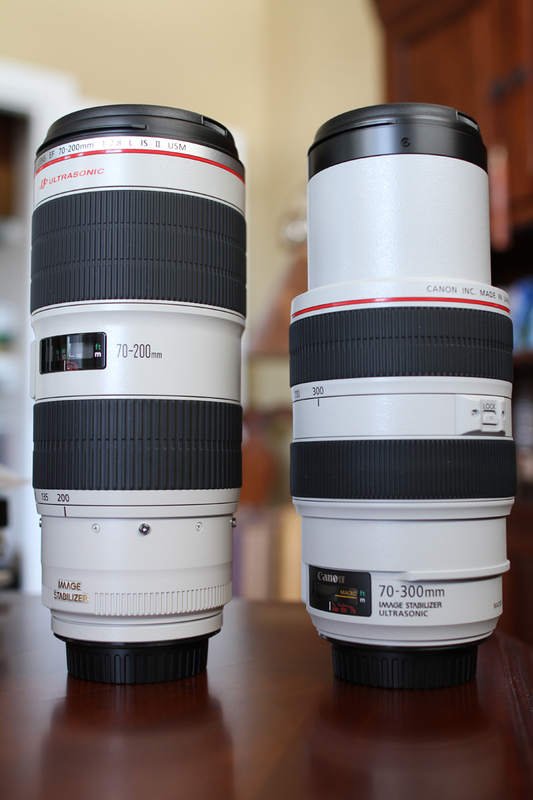 I recently ordered two lenses for comparison since they overlap in focal range: the Canon EF 70-300 f/4-5.6L IS USM and the Canon EF 70-200 f/2.8L IS II USM. I’m writing this post because I’ve seen quite a few reviews out there comparing the 70-200 2.8 or 4 against the older non-L 70-300 lenses, and hopefully this will help someone out as they make their purchasing decisions. First, about the 70-300. I’d ordered it thinking that this was the only lens I should consider. Some reviews of the 70-300 say it’s a fantastic lens, tack sharp, fast focusing, great focal length range, and easier to carry than the 70-200 2.8. Those are all true. After shooting with it for a few days, I was starting to notice that the 5.6 aperture at the long end of the lens lead to some relatively high ISOs (3200) in even what seem like well lit rooms, such as indoors with indirect sunlight in a room that has large windows on three sides. So, after some deliberation (and Canon’s recent instant rebate offer on the 70-200 f/2.8L II lens) I decided to order it as well and compare the two. The 70-200 2.8 II arrived at my house, and I took it out of the box. This lens is larger and heavier than the 70-300L, not unexpectedly of course. The size and weight aren’t prohibitive, but if you’re not used to large lenses, it may come as a surprise. I mounted it on my 7D and started shooting around the house. I like the increased subject isolation and faster shutter speeds of the wider aperture lens, definitely. As I shot more with them, I realized each lens is meant for different purposes even though they overlap in focal length. So, here’s my pros/cons list for these lenses. Keep in mind that any issues are nit-picks since both lenses are worthy of their “L” series moniker. Phenomenal image quality. These lenses are incredibly sharp. Superb build quality. Both lenses are very well built. Wider aperture: 1-2 stops more light than the 70-300L translates to faster shutter speeds and/or lower ISO in lower light, and less tendency to hunt while auto focusing. The 70-200 auto focuses in extremely dim light, whereas the 70-300 will focus hunt in lower light situations and even in some moderate light situations. 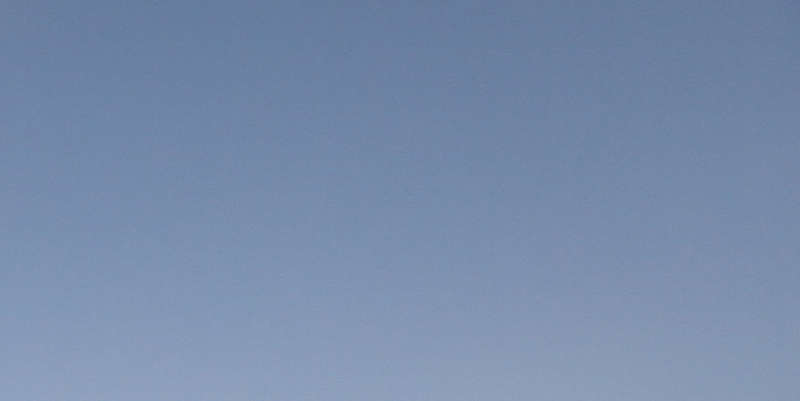 This is on my 7D; YMMV, as they say. The zoom ring is the ring that’s closest to the camera, which makes it easier to steady the camera. On the 70-300, the zoom ring is farther away from the camera. I find it slightly harder to steady the camera with my arm extended out like it is on the 70-300. A non-extending design (internal zoom). Even though the 70-300 is considerably shorter when retracted to 70mm (and it has a zoom lock), when extended to 300, the lenses are virtually the same length, with the 70-300 being just a touch shorter. I like the non-extending design because I know I can’t zoom in and bump something unexpectedly. A 77mm filter size. I have several other 77mm lenses and so I can more easily use filters for my other lenses without step-down rings. It comes with a tripod collar and a very nice case. The 70-300 doesn’t come with a tripod collar, and it’s about $190 as of the time this post was written. The zippered nylon case on the 70-200 is also much nicer than the bag that comes with the 70-300. Compatible with 1.4x and 2.0x teleconverters to take the lens to a 98-280 f/4 or a 140-400 f/5.6. Shooting at f/2.8 really has a narrow depth of field at or near the minimum focusing distance. It’s not quite as thin as what my 50mm f/1.2L can execute, but it’s enough where if you focus on a person’s cheeks closer to the nose, the person’s eyes will be slightly de-focused. Focusing on the eye will result in some softening of the ears. Subject isolation is excellent. Heavy, though this is less of a problem in practice than many people say (but I train with weights on a regular basis). I think every review I read about this lens said how heavy it was. My guess is none of those people have handled one of these (not that I have). I find now after handling this lens, the 70-300L feels like a lightweight. Large. It’s probably not possible to use this lens discreetly anywhere, though you can buy camouflage covers to help with that a bit. Less focal length than the 70-300, though it’s compatible with teleconverters to take it to 280 or 400. Relatively lightweight. The 70-300 is a heavy lens, but it’s noticeably less heavy than the 70-200. Less expensive. This lens is less expensive by a non-trivial margin than the 70-200. Supposedly compatible with a Kenko 1.4 teleconverter to take it to a 98-420 f/5.6-8. This lens is not compatible with Canon teleconverters. I have not confirmed this myself but some have claimed it works, and reports are that autofocus works on many cameras despite f/8 at the long end. This point is probably more of a wash with the 70-200 since it’s compatible with 1.4x and 2.0x teleconverters, but it’s worth mentioning. Longer focal length range. The extra 100mm of focal length affects the telephoto amount less than I was expecting, but it does make a difference, especially if you’re trying to capture a bird. Pairing this with a crop sensor camera results in some extensive telephoto capability (672mm equivalent at 300mm on a 1.6 crop sensor camera with the 1.4x teleconverter). Narrower aperture, which means pictures in lower light will have a higher ISO and/or slower shutter speeds, possibly resulting in blurred shots due to subject motion, or more ISO noise than desired. Tends to focus hunt more frequently than the 70-200. Tended to take pictures that were slightly darker than the 70-200 in comparable conditions with the same camera settings. This is a subjective “con”. A 67mm filter size. I don’t have a 67mm and so my 77mm circular polarizer needs another step down ring, or, more likely I’d just buy a 67mm circular polarizer. The zoom ring is the ring farthest from the camera body as compared to the 70-200L. Canon put enough competitive differentiation between the 70-300L lens and the others (70-200 f/2.8L II and f/4L) to justify its existence. Since it’s a tiny lens, I could see myself traveling light with this lens and my EF-S 17-55mm f/2.8 IS USM lens, covering the focal lengths of 17mm to 300mm, albeit with a small gap from 56-69mm and a variable aperture from 70mm upward. Overall, if you need the capabilities and convenience that each lens offers and can get both lenses, go for it. If you have to choose one over the other, the major differentiators between the lenses are the weight, price, focal length difference, and aperture. They really are lenses designed for different purposes, so whatever fits your needs best is what you’ll have to determine. I’m going to use the 70-200 for indoor shots and 70-300 for outdoor shots and travel. The 70-200 would be fine for travel if you don’t mind lugging around a huge white lens, but I’d rather have the smaller size of the 70-300 for travel. The 70-200 is useful when you need the wider aperture for whatever reason: subject isolation, faster shutter speed, etc., and don’t mind the extra weight and can live with the shorter focal length. I plan to post some sample pictures from each lens in a future post, but here are pictures of the lenses in both retracted and fully extended positions. (Click to enlarge each picture.) These pictures were taken with a 24mm f/1.4L II lens. 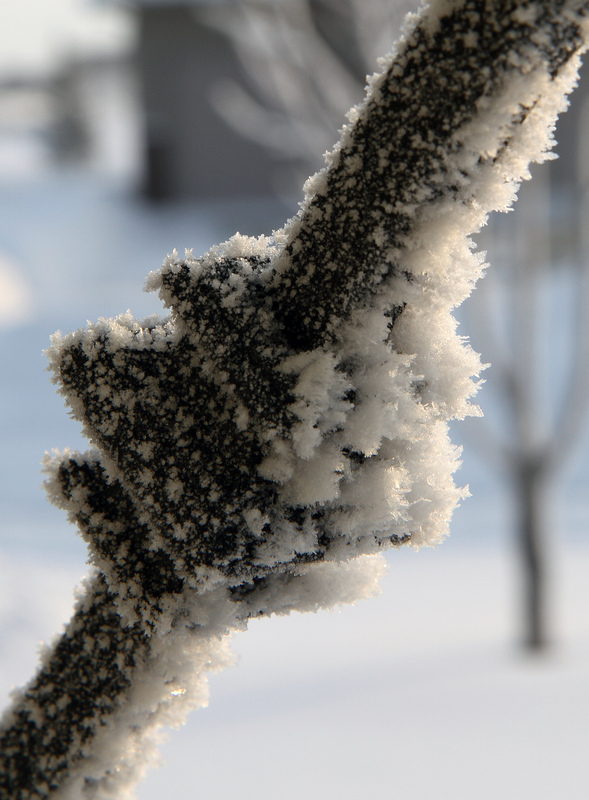 Some fog rolled through town a few days ago and left this frost on my front railings and porch light. The Facebook photo viewer just isn’t crisp enough so I’m putting them on my blog. Click on each for a larger version. Seth Godin had a post today called N-1 where he asks what would happen if you did N-1 things (i.e. eliminated one thing at a time) until you could do a world class job on what’s left. He’s contrasting that to the philosophy of Fred Wilson’s N+1 theory which says there is always room for one more of anything. One more task, one more hobby, one more area I should master, a thousand irons in a thousand fires. Both seem correct, but seem mutually exclusive. These contrasting viewpoints are particularly relevant to me recently, as I’ve been working on eliminating excess distractions from my work and life. I’ve found that I have a commitment limit, over which things spin out of control and little gets done. In computer-speak, I start thrashing. The previous few years of my life largely consisted of adding more, more, more. More work, more stuff, more hassle, but unexpectedly, less value. Now, my focus is on delegating, outsourcing or systematizing that which can be done by others or automated systems and concentrating my rather limited amount of time on what adds the most value. Back to N-1 and N+1. Perhaps why both seem correct is that a blended approach is best, pursuing N-1 until comfortable that I’m no longer project-thrashing, then applying N+1 to what’s left. That’s what I think Seth is saying, but this redefines N+1 as a valid, complementary strategy within the confines of N-1. In other words, instead of grazing the surface of countless projects, we deep dive into a limited number of specific areas and projects to achieve stellar results. I call this theory N±1. Last year, I wrote up a lengthy post summarizing my notes from the 2009 Business of Software conference, along with links to some archived tweets. This year, I’m taking a completely different approach: a summation of what I’ve felt during and after the conference. Others have already provided detailed notes about the topics of each speaker and photos of many of the speakers, so I won’t bother with any of that since I’m trying to embody the “be different” mantra espoused by Youngme Moon. The 2010 Business of Software conference was inspiring, practical, thoughtful, and soul-searching. This was the year of the deeply transparent personal story. I somehow felt connected to many of these speakers after they shared these parts of their lives that so many of us experience but few will acknowledge to others: fears of not being able to be a sales person, leaving a job, running out of money, and many more private but common business phobias. (My favorite humorous, yet practical work tip was Peldi‘s from Balsamiq: work while your family is sleeping so they don’t know they are ignoring you — I’m doing that as I write this!) The speakers presented insightful stories that made me think long and hard about me. There is little so powerful as self-examination. There are so many different stories out there, so many ways to weave paths through business and life. Reflecting on where others have been and how that relates to where I want to be was a notable outcome of BoS this year. Being true to yourself, not leading if you’re not passionate, failing everything once, and embracing your strengths are several ideas that stood out for me this year. It could have just been me and my unusual state of mind this year, but so much of the conference was about alignment of personal issues with professional goals, and of course, passion. Although I didn’t get to participate in the breakout sessions due to some other meetings with other people in my company, I still had a solid sense of camaraderie with the group. I especially enjoyed the meals; every one was a chance to meet with others who have a fundamental understanding of the issues involved in running a software business. One breakfast, I was able to engage with Scott Farquhar from Atlassian about the topic of walls, obstacles standing in the way of getting something done, and how there isn’t really any magic to breaking through these walls other than to persevere with hard work. Hearing that from someone who’s younger than me and running a company that just raised $60mm in funding is validation that my struggles are not unique, but outcomes are. Scott lead a few conversations at my table with “what’s your biggest challenge facing you today” — a great dialogue starter. I haven’t spoken much about the practical side of the conference I noted earlier. Much like Seth illuminated the new reality that the business of software is less about brilliant programmers and software than creating and maintaining tribes, the practical side of the conference is less important to me at the moment. There were discussions of how to build e-mail lists, how to get people to come back to your site, how to calculate particular metrics that drive customer retention, building a cluster immune system, M&A tips, and other useful information, and I’ll be able to use some of that. It’s just less engaging to me than the rest. So, thanks to all of those who shared their personal stories, spurring deep thinking on my part. I’m grateful for the opportunity to have heard them all speak and the resultant contemplation of the past, present and future of my own personal story. After living in North Dakota for over three decades, and moving from the warmer part of the state to the colder part of the state about a dozen years ago, I offer you the Lazy Man’s Winter Survival Guide for your convenience. None of these items are essential, but have made my life better. Heated garage. 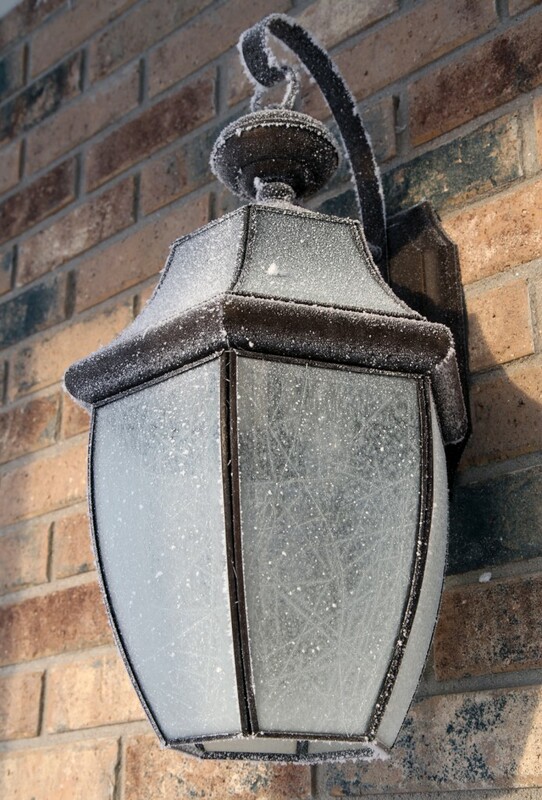 Last winter, I’d hired an energy-efficiency expert from Xcel Energy in Minneapolis to review my house. He commented that he thought it was unusual that my house had a fully insulated, sheetrocked, and heated garage. As I write this, it’s approximately 22 degrees below zero. That’s so cold I can put some snow from the outside in my deep freezer to warm it up. Cars run a lot better when the garage is kept above freezing. Since my daughter was born last year, I’ve cranked up the heat to 65 degrees in there. All I can say is, it’s very nice. Also, the garage door should be made as air tight as possible. A variety of indoor recreation. There’s a reason that money buys more real estate square footage in ND… not only is it in less demand, but the space is necessary for sanity. Winter sometimes feels like I’m living on a moon colony. To move from one part of the town to another, I hop in my heated pod (my car), travel to another location, put on my space suit (a jacket so heavy it would crush my 10-month-old daughter), and dash as fast as I can to indoors before I freeze. So, it’s essential to have a variety of indoor recreation activities. Some may opt for outdoor recreation, such as snowmobiling or ice fishing (someone I know went ice fishing at 28 below zero last week), but I am not one of those people. Reasonable amounts of indoor living space will make spending long winter days inside more tolerable. Heated floors in the basement and under any tile. If you are building a new home and will have a basement with a cement floor, make sure to heat the concrete slab. It will make the basement livable. I didn’t do that, and my basement stays about 55 degrees on the floor, which is really too chilly to inhabit. If you have any tile floors, make sure to install heat under them, too, or your feet will be cold all winter. A remote auto starter. 20 below zero temperatures, where exposed skin will freeze in less time than the average series of commercials on television, make a remote auto starter part of the essential winter survival kit. Running the car for at least 15 minutes before getting into it will at least bring it up to zero degrees on the interior and it won’t make quite so many groaning and popping noises when driving. A vehicle with AWD or 4WD. I recommend one that has full-time all wheel drive with the option for 4 wheel drive. Beware of vehicles that are really rear wheel drive most of the time unless 4WD is engaged, like most pickups. Snow drifts appear at the worst of times, and even the finest fleet of snow plows won’t reach residential areas quickly enough. Yes, this means lower gas mileage, and no, you won’t care when you don’t get stuck. A cell phone. If you travel, you must have a fully charged cell phone. Bad things happen to even the most prepared, and this will help you reach someone who can help. A winter survival kit. Put these items in every vehicle you own. See previous point. 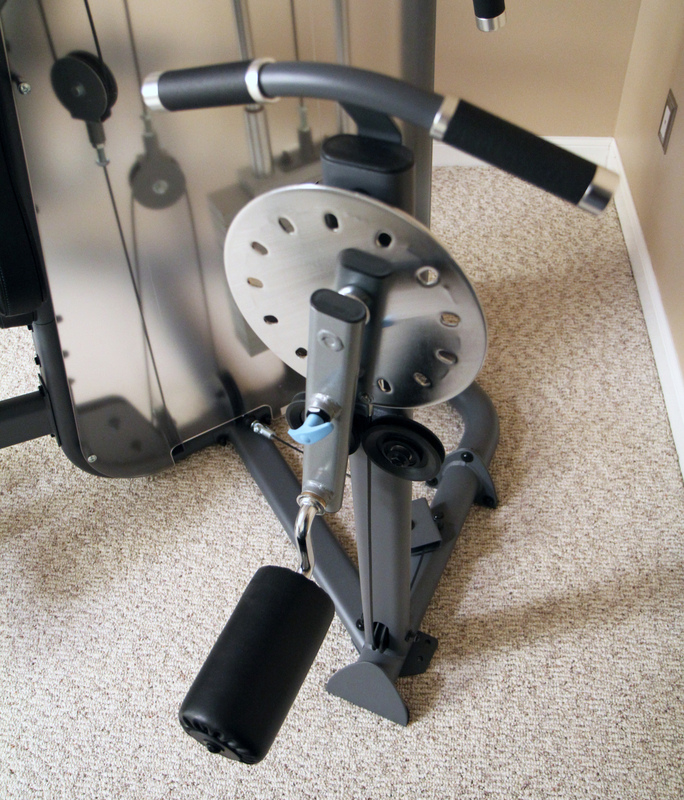 Home exercise equipment. Not leaving the house for days at a time doesn’t help one get enough exercise per day, so some sort of indoor exercise equipment at home is very helpful. There are days that one can’t get to the gym due to the weather or it’s just too cold to bear the thought of leaving the house. Delivery services. Think local grocery stores that deliver, and Amazon.com. They’ll bring it to your door. Even the mail man won’t bring mail to my door; I have to walk across the street. Money you spend on shipping will be spent on gas, idling the car endlessly to keep the temperature up, so shopping online makes sense. Snow removal service. I thought I was a tough guy (hey, I’ve worked out with weights for 20 years) and have shoveled an unknown number of metric tons of snow in my life, but the last two winters in ND have broken me. Completely. You win, old man winter. I’ve hired a snow removal service to fight back and haven’t had a second thought since. Snowblower. Don’t be fooled by the snow removal service listed above. You’ll still need a snow blower, because, after all, when the roads are closed, even the snow removal people can’t get to your door. Don’t buy a “snow thrower”; a two-stage snow thrower with at least 10 horsepower is what you’ll need to cut through packed 4+ foot snow drifts. Shovel. 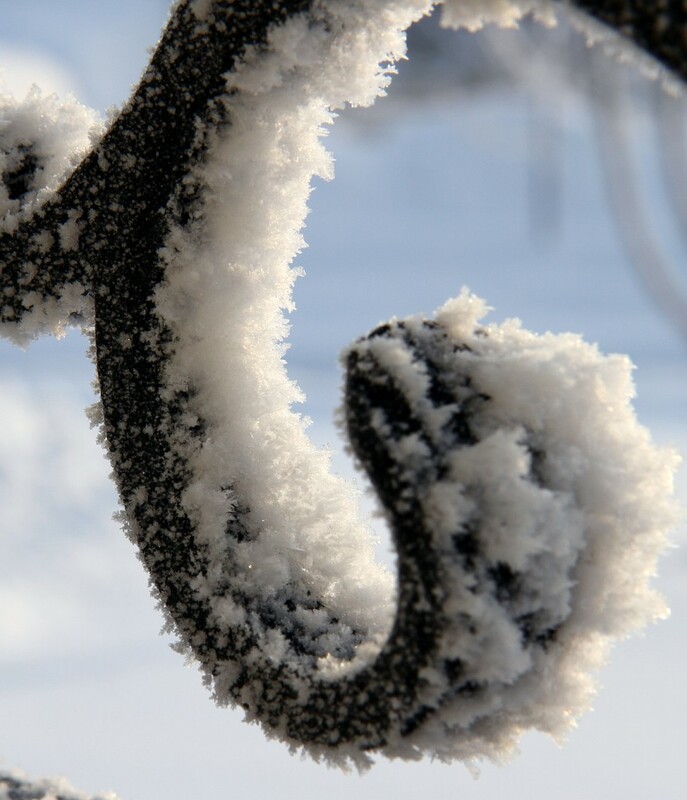 Good for quick shoveling and for whisking snow away from edges where snowblowers don’t reach. Keep it in the heated garage. Winter tires. All-season tires on the vehicles just don’t cut it. They turn into virtual slippery boiled eggs when the temperature is low. Get some Blizzaks. (I need to take my own advice on this one.) This point is even more important if the car has summer tires. Hot tub or bath tub. An indoor hot tub, that is. There are days when the cold gets into my bones and I just can’t warm up, so hopping into a 100+ degree tub of hot water is the only way to warm up. A hot bath works too, and is less maintenance than a hot tub. Furnace vents in the floor, or heated floors throughout the house. This may seem like a strange one, but if the house has a forced air furnace and the vents are in the ceiling, the floor will be cold. Heated floors are another nice way of keeping warm but are fairly rare. 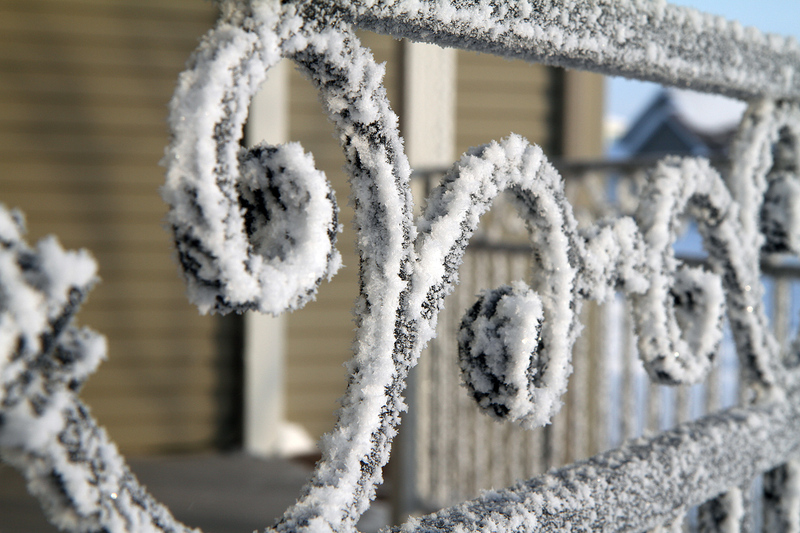 Do you have any other winter survival tips? My aging work PC is ready to move on to its retirement phase, browsing the big Internet in the sky. As a result, I’ve recently been pondering whether to buy a Mac or PC. Now, Mac enthusiasts are probably shouting “Mac! Mac!” while the Windows/PC supporters are saying, “why spend more for a Mac when you can get a quality PC for less money”. What’s the dilemma, you say? See, I normally buy Apple for the thoughtfulness that goes into the hardware design. I have a curvaceous MacBook Air that’s a joy to use, and it is well designed even down to the tiniest detail (except for the sharp edge on the aluminum body facing me). If I’m buying a laptop or an all-in-one computer, I’d get a Mac primarily because of the hardware. The design is great, and it can run Windows if the need arises. The operating system is a wash for me — Mac’s OS X advantage (for me) is its BSD roots, but Windows has enough other tools where any utility I need from OS X is available. Stability in Windows has been addressed, and from a technical perspective, Windows 7 is as of this writing, more secure than OS X. Windows 7 now even has a dock like OS X. It’s also nice, as a technologist, to be well-versed in the popular operating systems, and there’s nothing that will get a person quite as familiar with a piece of software than using it daily. Desktop computers are another issue entirely. Sure, Apple’s Mac Pro is a decent looking desktop computer, but I think it’s somewhat bland in appearance. Apple doesn’t currently offer SSD hard drives either. The Mac Pro does offer the option of 8 core computing via two quad core CPUs, one big advantage the Mac Pro has over other desktops I’ve seen from places like Velocity Micro, Alienware, and Cyberpower that max out at a single quad core CPU. In other words, the best I’ve seen from Apple has 7,200 RPM spinning-platter hard drives, but has eight CPU cores. The best I’ve seen in desktop PCs have SSDs, but only four cores. I want SSDs and eight cores. What do you think is a good desktop computer? So do good programmers tend to read the fine print? Does reading the fine print have anything to do with attention to detail? I’ll say that does. If a person is able to pay attention to the real content of the message (“motion has been added for dramatic effect”, “compensated endorser”, and other such gems) while ignoring the hype, that person just might be the kind of critical thinker who can determine the most productive project to address first and act on that. Time is limited, potential projects are unlimited, but productive people know what to do next that will produce the highest possible value. Do you read the fine print? Greg Kilwein has been writing software since he was 7 years old and so has a few opinions on the topic. His endeavor of the last decade or so has been web applications. He's also interested in photography, management, and business so he may write about those from time to time.